Visit Acura of Milford to get an up-close look at this impressive model in our extensive MDX inventory. This distinctive grille design is unique to Acura and helps to signal that this is a prestige automobile. At the same time, it helps to ventilate the engine and enhance performance. This type of light does a better job of lighting up the road and signaling your presence to other drivers. And thanks to the unique jewel-eye headlight design unique to Acura, these lights become a bold stylistic element as well. 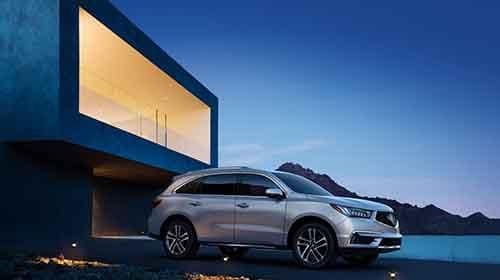 The MDX sets itself apart by integrating the dual exhaust into the design of the rear fascia and coating the outputs in chrome. West Haven drivers have the option to equip larger 20-inch wheels to help boost performance of the MDX as well as give it a more commanding look. Thanks to national incentives, the MDX is available for an accessible MSRP. Be sure to consider other popular models as well. And no matter what appeals to you, work with our dealership to get easily approved for financing. Head to Milford soon, and contact our team if you have questions.